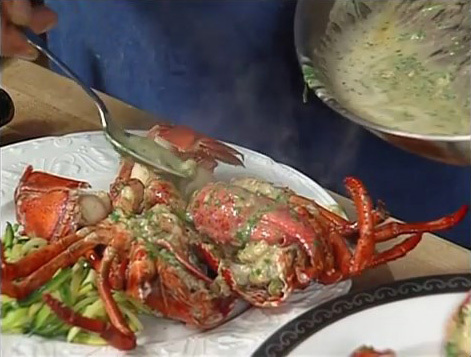 Perhaps a visitor can answer this question: Why is it that nearly every time I see whole lobsters awaiting prep on UK cooking shows, they’re uncooked but stone-cold dead? I just saw this again in the ongoing series 10 of MasterChef – The Professionals, screenshot of the daisy-pushing critters above. Because I’m so used to lobsters tootling about in my kitchen and giving me the tail-flapping, two-claw salute when I pick them up, it gives me the willies to see a passel of them lying on the work surface dead as doornails, but perhaps there’s a rational explanation that will calm me. I could understand par-cooked, but they’re definitely raw – their colour alone tells you that. You couldn’t sell a dead, raw whole lobster here. I’m not sure if it’s against the law – it probably is – but that doesn’t matter: No one would ever buy one. My only thought is that perhaps they dispatch them moments before filming begins in order to spare sensitive viewers. That better be it – I’ve smelled lobsters that have been dead for a little while. Firing them into high Earth orbit or, better yet, the Sun, would be a better option than eating. 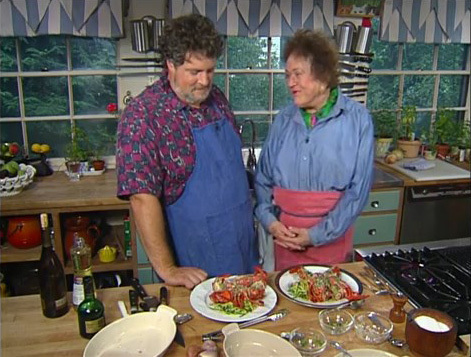 Julia insisted that Jasper White make his pan-roasted lobster. It was his signature dish, steeped in cognac and butter, and a perennial favorite of hers, perfect for the home cook, but there were problems before filming even began. Weeks before, during a cooking demonstration on Today, Katie Couric shrieked when a chef killed a lobster. It brought media attention to the process of killing lobsters and PETA jumped on it right away. The organization’s power made [producer] Geof Drummond nervous. “He prefers we don’t kill it on television,” Julia explained to White, sitting in her garden during a break. Julia shook her head. “Then we’re not teaching them anything.” She got up and walked around the yard. Together, they concocted a way to sidestep a possible outcry. As the lesson began, Julia stood gazing at White and his lobster. “So, dearie, how do we start the dish?” she asked. “First we cut up the lobster,” he said. Everything had to do with the expression on Julia’s face. She kept it glassy-eyed, completely impassive. For all anyone knew, she might have been watching a mother diapering a newborn, as White dispatched the crustacean. He had a Chinese cleaver the size of a scimitar and he wielded it like a cartoon character. His hands were a blur—swoosh, swoosh, swoosh! Presto: the lobster lay in pieces on the cutting board. No one uttered so much as a sigh. “Then we’re not teaching them anything.” My hero. 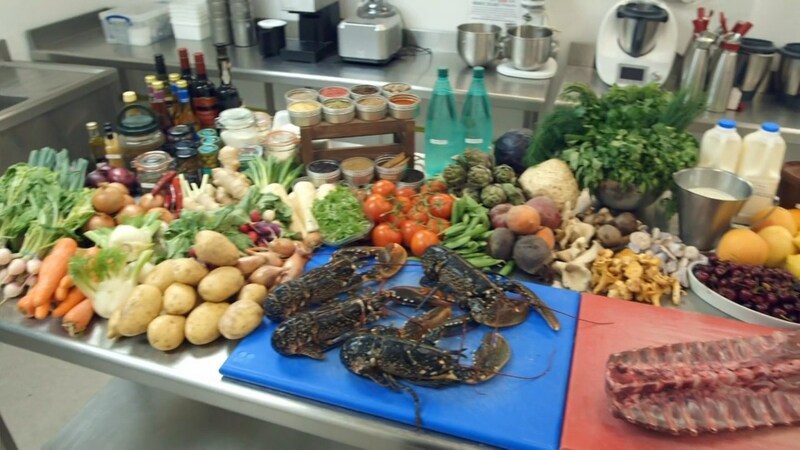 This entry was posted in Cooking, Television and tagged In Julia's Kitchen with Master Chefs, Jasper White, Julia Child, lobster, MasterChef The Professionals. Do you eat your fish alive? Chickens? Beef? Sectioning and/or cooking shellfish alive is needless, don’t try to justify it to me.